So you might have seen the Ribena campaign around, it started about a month ago with some TV appearances and of course appearances on the Nuffnang network. The latest happening was the unveiling of the biggest monument to love! 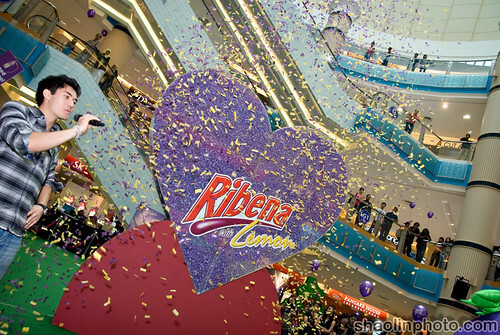 The Purple heart is made of more than 30,000 Ribena purple bottle caps collected from all around Malaysia from peoples who have come to know of Berry’s plight to impress Lemon with this massive Valentine gift. Fans of Berry and Lemon were invited to deposit the caps at collection centres at Media Prima Berhad’s and The Sun’s office prior to Valentine’s Day, or they can personally drop the caps at Sunway Pyramid on event day. We were all there to check it out, of course plenty of bloggers were there. From L-R: Tzia, Huai Bin, KimberlyCun, RedMummy, Mellissa & KY. There was a cheer-leading squad, helping Berry to collect the Ribena caps to fill the heart. There was various activities going on and games for all ages to play. The gracious hosts for the event were the lovely Belinda Chee. And the handsome Henry Golding (update your blog Henry!). The stars of the event were of course Berry and Lemon! Then the Purple Heart was launched! KY and Mel with the heart and the stars. And that was it, then we went to Wendy’s and got some Chili and burgers! 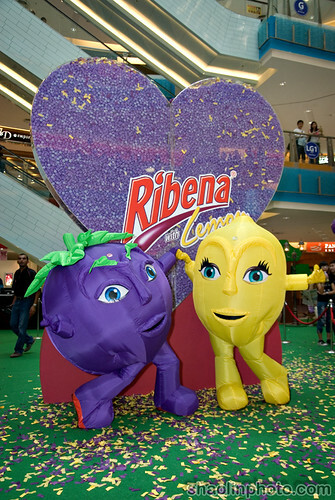 Go drink some Ribena Lemon ok.
9 Responses to Ribena Purple Heart for Valentine’s Day! Belinda looks like lemon in yerrow. Lemon didn’t want to layan me and Mell! See! 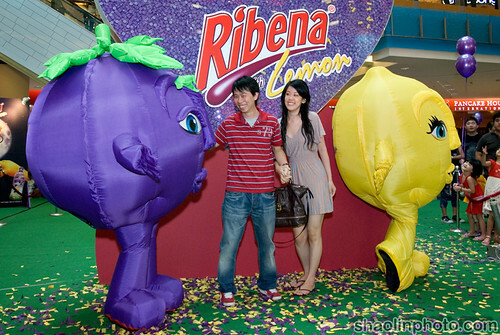 Cool stuff, I saw the posters but didn’t know that they had something called Ribena Lemon. It’s been ages since I last drank it. belle: Yah she’s really sweet. andrew: Yah don’t drink too much la. KY: LOL yah lansi wor. Mark Leo: Yah, new flavour – it’s pretty good. I always liked Ribena with lemon. Angie Tan: Indeed, universally loved. Haven’t tried Ribena Lemon yet… gonna get a bottle later. Hehe.